This is the User’s Guide (and Help pages) for MemoWiki. MemoWiki is a Wiki » intended for personal documentation, research, and small-scale collaboration. It allows the viewing, editing, and maintenance of a collection of pages using just a web browser, as shown in the image on the right. To make it easy to support research, MemoWiki integrates its pages with academic references and data items (which can be edited just as easily as Wiki pages) and other files (such as papers, programs, and images). Pages are entered using plain-text markup, developed for SpeleoGroup » and based on early Wikipedia » markup. Here’s a sample page and the markup used for it. Academic references are supported, too, again with plain-text markup; here is a sample reference and the markup used for it. Pages, references, and data items are grouped in Topics; to start a new topic, first use the Topics button on an active MemoWiki page to view existing topics and their names, choose a name for your topic, and then click on the Add Topic button to start creating the topic. All pages, references, and data items are held as simple plain-text files, so are available to other tools (for example, you don’t have to use MemoWiki to edit pages or references); MemoWiki control files, too, are all plain text. Other files, such as images and PDF »s, (which may or not be plain text) can also be held in a topic. You can link directly from any MemoWiki page to another page, a reference, a data item, a file in the topic (including images), a World Wide Web page (or other URL), a geographic location, or a Wikipedia page using simple square-brackets notations (‘remote’ links (to data not in a MemoWiki collection) are identified by the symbol “»” for Web pages, or “Δ” for GPS locations). You can make a static snapshot of a topic at any time; this snapshot does not require any software to view (other than a web browser), and is suitable for publishing to most Internet web servers; publishing can be done directly as a MemoWiki action. Several tools are provided for navigating within MemoWiki topics; as well as following links, you can list the pages, references, data items, and files (and sort them in various ways), view recent changes, check for missing pages and links, search for words, and so on. MemoWiki can be used locally on a single machine or as a web server, either as a single-user Wiki (all changes are anonymous) or using the multiple-user support, which allows more than one user to edit pages and be identified. MemoTrove data items (plain-text tagged data) are integrated into MemoWiki. This allows individual pieces of data to be shared between pages and topics, and also allows the data items to be viewed and edited as easily as Wiki pages. By default, MemoWiki pages drag in no other files (images, style sheets, etc.) and use no scripts, unless explicitly coded in the content of a page; this makes them both small and fast to load. User style sheets can be supplied to change the formatting of pages (for example, to change the default text font). Apart from the web server, MemoWiki is written entirely in Rexx, using the ooRexx » (Open Object Rexx) implementation; this makes it easy to modify and extend. MemoWiki is robust (subject to the constraints of the operating system) — if, for example, multiple users edit the same page, any editing conflict is notified to the user, and all versions of the page are saved and are available in the history of the page; no database is used. Currently MemoWiki runs on Linux or Windows, using the GoServe web server; however, operating system and GoServe dependencies are localized so it should be easy to port it to a different platform or server. Some functions are only available on one or other platform, and recent additions have not been tested on Linux. MemoWiki comprises a web server (a Linux or Windows version of GoServe) and a collection of Rexx programs which effect the various actions that the client can ask for (view a page, edit a page, show the page history, etc.). Please note that these programs are only available within IBM at present – sorry. The server can be started manually or on system startup. Here are the detailed installation instructions. Once MemoWiki is installed and the server has been started, you can immediately start working with it. Topics can be creating simply by clicking on the ‘Add Topic’ button on the Topics page and then supplying a name for the new topic. wiki holds the Wiki pages (.wiki files). 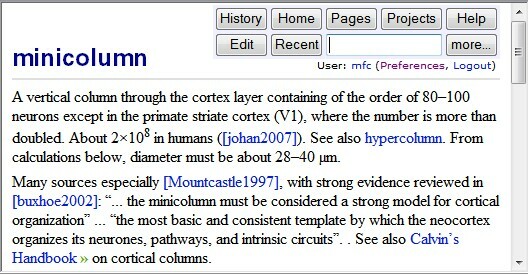 Wiki files may be created and edited with MemoWiki, using plain-text editing with a simplified markup for indicating fonts, formatting, and links. The page with the same name as the topic is the ‘home page’ for the topic, and you can edit this immediately you have created a topic. The simplest way to create another new page is to make a link to it in the home page (or any other page) and then click on the link. To link to a Wiki page from another page, use the notation [page name]. If you want different text to appear than the page name, this can be placed in the link, following a vertical bar. For example, the links: [sample page] and [sample page|a test page] appear thus: sample page and a test page. refs (optional) holds References (.ref files). References are also plain-text files (using a specialized markup) and may be edited just like Wiki pages. To create a new one, use ‘Add a new Reference’ on the actions (more...) page. To link to a Reference from a Wiki page, use the same notation as for other links, for example, [smith1998]. trove (optional) holds Data items (.mtr files). References are also plain-text files (using MemoTrove markup, described elsewhere) and may be edited just like Wiki pages. To create a new one, use ‘Add a new data item’ on the actions (more...) page. To link to a Data item from a Wiki page, use the same notation as for other links, for example, [Dan yr Ogof]. Data values from data items can be loaded (using the mtr keyword on the link) and then used in the Wiki page using entity references. (optional) holds general files (e.g., .pdf documents or image files such as the one shown to the right). Images and text files can be embedded in a displayed page; other files can be be opened with the browser by clicking on a link to them. General files cannot be edited directly (unless your browser allows this), but you can use one of the ‘Explore’ options on the actions page to view the files with Windows Explorer if you are on the same machine as the server. The files directory may have subdirectories. To add (upload) a file to a topic, or to replace one, use ‘Add or replace a File’ on the actions (more...) page. To delete a file, replace it with an empty (length=0) file. To link to a general file from a Wiki page, use, for example, [smith1998-spikes-paper.pdf], or [subdir/commentary.txt]. 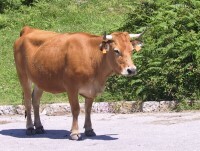 The image above is included in this page using the link: [Cow.jpg|In the Picos de Europa|image width=200 height=151]; in this link the vertical bars separate a caption and some parameters (the width and height parameters are optional – see the Links page for details). Links are resolved in the above order so (for example) a Wiki page called ‘smith1998’ would take precedence over a reference of the same name. A link can be set up to specify a GPS location, Δ, which links to Google Maps. Here is a full description of MemoWiki Links. Whenever a Wiki page, Reference, or Data item is edited or deleted, a dated copy of the page is archived in an archive directory within the topic directory; you can view the archived copies, revert the current page to an earlier version, or delete archived copies using the History page. Other facilities let you look at various lists of pages, including a list of recently edited pages and build or browse a static snapshot of a topic (which can be published to a web server), among other things. On any page, click on the ‘more...’ button for a complete list of available actions. Here is a list of Help pages, and some information about multiple-user support. An active MemoWiki page will have four or more buttons (or a small link ‘more...’) at top right. If the page you are looking at has only one (‘Home’) then you are probably viewing a static snapshot of a MemoWiki topic, which can only be viewed and not edited. A MemoWiki documentation snapshot can be found at http://speleotrove.com ». MemoWiki and the GoServe server on which it runs are maintained by Mike Cowlishaw ». Please send me e-mail if you discover any problems with the MemoWiki software or MemoWiki topic pages.